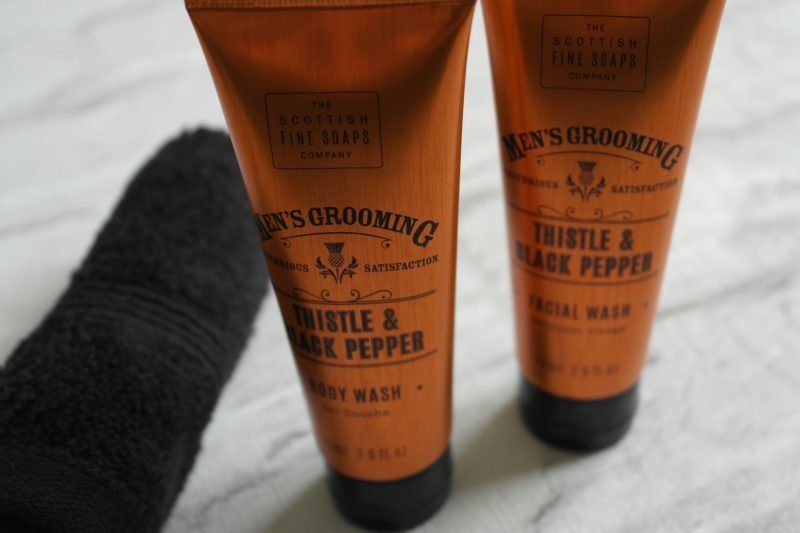 You might have caught my recent post that featured a Thistle & block pepper moisturiser, here I get to find out more about the men’s grooming range from The Scottish Fine Soaps Co. I’ll have to admit this is a new brand to me that I’d not come across until recently. If you don’t know much about The Scottish Fine Soaps Co. (like me!) they’re a family run business that have been going 40 years! They pride themselves on searching Scotland and the World for ingredients that have unique fragrances and beauty benefits. 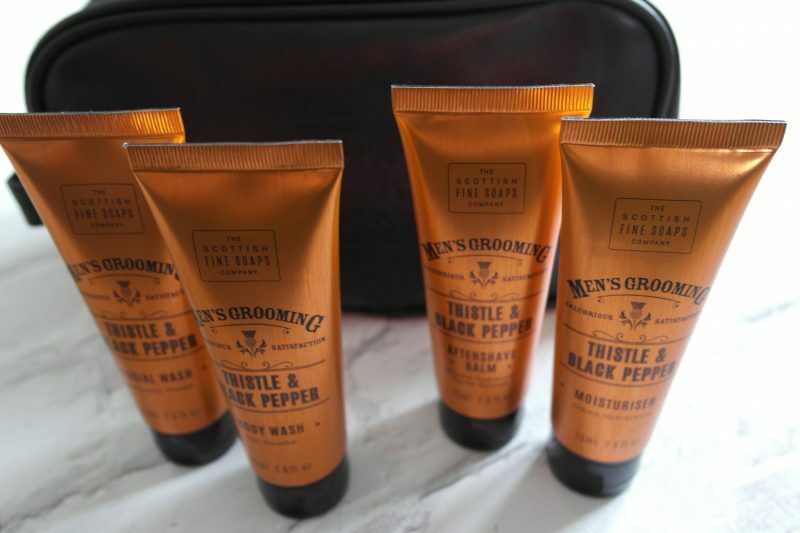 I was sent the men’s Thistle & Black Pepper travel bag that contains 4 travel sized products; body scrub, body wash, face wash & aftershave balm. 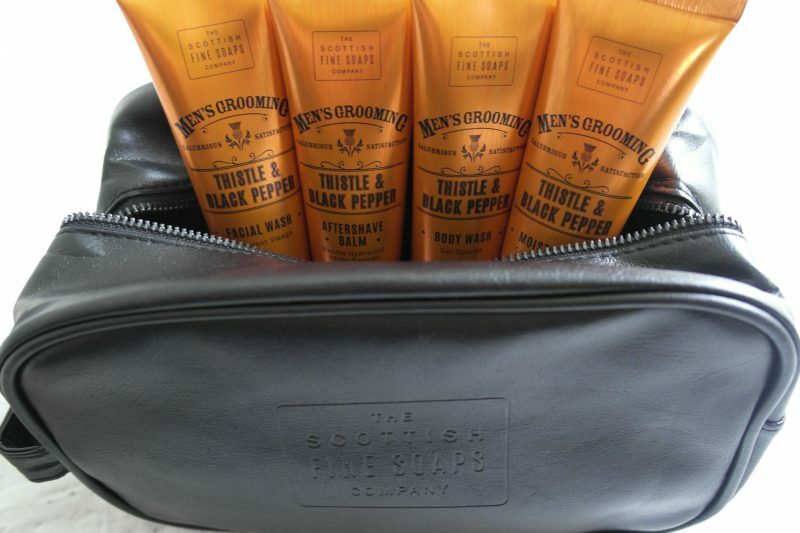 They all come in a stylish leather looking wash bag. All the products come in handy 75ml squeezy tubes, a perfect size for travelling. Lets start by mentioning the fragrance, it really is unique! I’m not sure I’d recognise it as thistle & black pepper though, I mean what does thistle even smell like? The black pepper notes do stand out amongst the other notes of tonka bean, sea buckthorn with lavender, and woody notes of sandalwood and amber. It is quite an intriguing and alluring fragrance which makes you want to use it again. As for the packaging, it’s modern and vibrant, but has a very retro feel, it definitely stands out! Formulated with milk thistle extract, known for its health benefits. The face wash has a gentle formula and cleanses daily grime and oil buildup with relative ease. Both the face and body wash lather up well to create a rich foamy lather. They’re ideal products for that ultimate ‘wake up’ factor to kick start your morning routine! I’m not one for using an aftershave balm due to my sporadic shaving routine as I always suffer skin irritation on my neck area. When you’ve had a shave, you need a product that is nourishing and soothing on skin. It gives a slight tingle when you first apply it which can be quite invigorating. The balm absorbs easily into skin and drys quickly without leaving any shine. 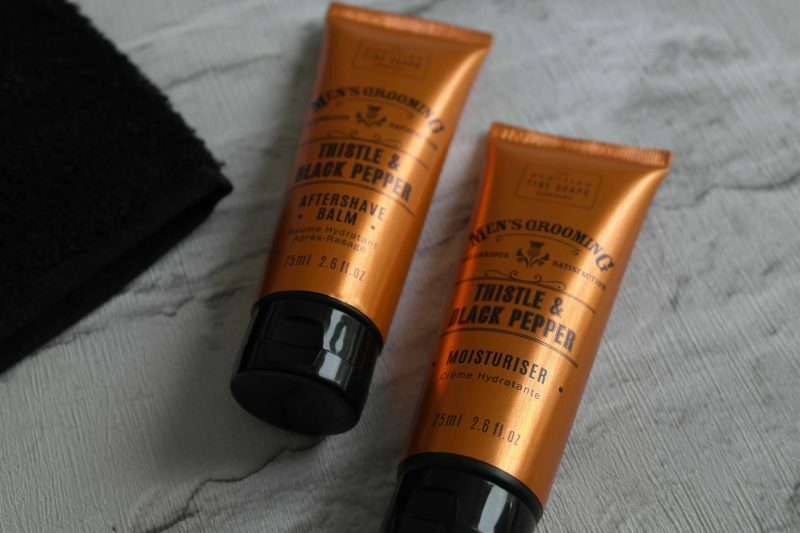 To complete your post shave routine apply the Thistle & black pepper moisturiser to help hydrate and protect your skin. For me, the thistle & black pepper scent stands out the most in the moisturiser. Like the balm, it absorsbs easily and doesn’t leave any greasy residue. 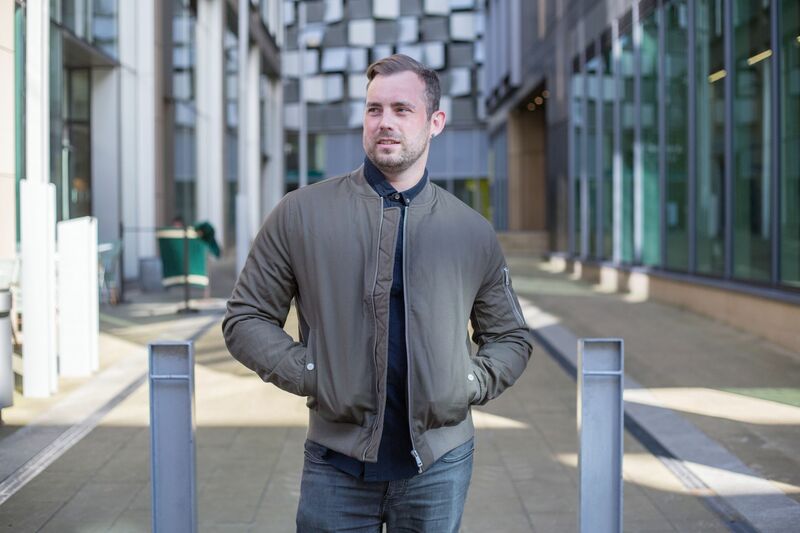 The men’s range includes various grooming products including beard care, shaving and also Eau de toilette fragrance. The travel set is reasonably priced at £19.99 & that includes the sleek looking wash bag. Check out Scottish Fine Soaps for the full range or to make a purchase. Have you tried any of the Scottish Soaps products? 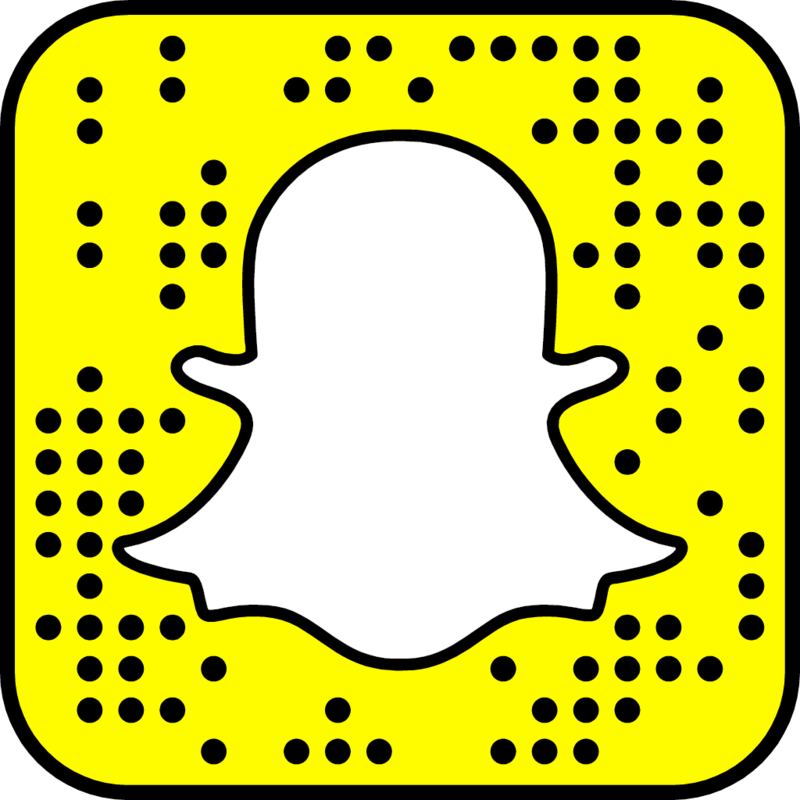 Let me know if you have in the comments below.